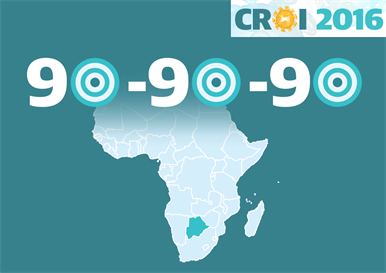 Botswana is already close to reaching the 90-90-90 target for testing, treatment and viral suppression, and is ahead of the United States and most European countries in its efforts to improve treatment coverage, Tendani Gaolathe of the Botswana-Harvard AIDS Institute Partnership reported at the Conference on Retroviruses and Opportunistic Infections (CROI 2016) in Boston on Wednesday. Furthermore it has achieved this level of coverage when providing treatment to people with CD4 cell counts below 350 cells/mm3, even before moving to providing treatment for everyone diagnosed with HIV infection. An analysis of treatment coverage in a large population-based study of antiretroviral treatment as prevention – the PopART study – also found that substantial increases in treatment coverage had been achieved as a result of a comprehensive package of home-based HIV testing and linkage to care in Kwazulu Natal, South Africa, and in Zambia. Viral suppression in 90% of people on treatment by 2020. This sequence of actions, or `treatment cascade` would result in viral suppression in 73% of all people living with HIV by 2020, enough to greatly reduce HIV transmission and gradually reduce HIV prevalence. Previous international reviews of treatment cascade performance have shown that northern European countries and Australia have made the greatest progress towards reaching the 90-90-90 target. The most recent review, presented at the Eighth International AIDS Society Conference (IAS 2015) last year in Vancouver, found that Switzerland, Australia, the United Kingdom, Denmark and the Netherlands are well on their way to achieving this target; in each case, easily attainable improvements in the rate of diagnosis or treatment initiation should allow these countries to reach the goal. That study found that 32% of people with HIV in sub-Saharan Africa were virally suppressed, compared with 30% in the United States. Botswana has been an international leader in providing antiretroviral treatment to its population. It was the first country in sub-Saharan Africa to provide free antiretroviral treatment to people with HIV, in 2002, and a recently published review of the treatment programme’s impact shows a steep decline in mortality among people enrolled in treatment since 2002. To assess the extent of treatment coverage – and how far Botswana needs to go – Botswana-Harvard AIDS Institute Partnership carried out a random population-based survey in 24 districts of Botswana from October 2013 to July 2015, as part of a larger community-randomised study of an HIV prevention package. The random sample was constructed by selecting 20% of households at random within 24 districts. Adults aged 16-64 were invited to give blood for HIV testing and fill out an individual questionnaire. Samples which tested positive for HIV were tested for HIV RNA (viral load). Eighty-one per cent of eligible household members took part in the study (10% declined to take part and 9% could not be contacted). A total of 12,610 people participated in the study. Of these, 29% were HIV-positive and 83% of these people already knew their HIV status. Of those who knew their HIV status, 87% were already taking antiretroviral therapy and 96% of those on treatment had an undetectable viral load (below 400 copies/ml). Overall, 70% of people living with HIV had a viral load below 400 copies/ml. Younger age was the strongest predictor of being undiagnosed, not on treatment and not virologically suppressed. People aged 20-29 were around 40% less likely to be virologically suppressed than people aged 50-59 and those aged 16-19 were almost 60% less likely to be virologically suppressed. Men were slightly less likely to be virologically suppressed, and being single or never married or having a higher level of education was also associated with a lower level of attainment of the target. These results suggest that Botswana is already very close to achieving the 90-90-90 target even though these data were collected in a period where treatment was available to people with CD4 cell counts below 350 cells/mm3, prior to 2015’s World Health Organization recommendation of treatment for all. Gaolathe T et al. Botswana is close to meeting UNAIDS 2020 goals of 90-90-90 coverage. Conference on Retroviruses and Opportunistic Infections, Boston, abstract 111.